If you are a standup paddleboard junkie, it’s likely that you will also love Kayaking. 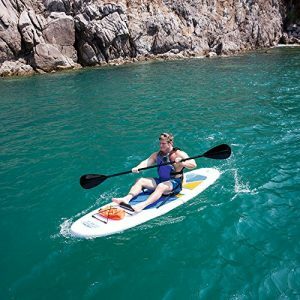 After our popular best inflatable paddle board reviews post, we thought a best inflatable kayak review post would be appreciated by our readers. The main advantage of inflatable kayaks is storage and portability. 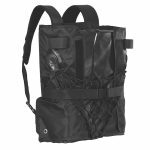 They can easily be transported in a car boot and carried by one person to your kayaking destination. Buy a hard shell kayak will need a dedicate storage space. Yes. Modern materials are very durable. Most are made of a heavy-duty vinyl which is puncture resistant. Most will use a PVC based fabric, but some will be made a tougher material called nitrylon, which is a synthetic rubber. Yes. Today’s technology and 2018 designs mean all the kayaks we have reviewed are very stable in water. Should I just buy a hard shell kayak? If you have the storage space at home and looking to get more serious about kayaking, then a hard shell might be good option. We advise to start with an inflatable kayak and see how you get on. Can inflatable kayaks go on the sea? Yes, especially if you buy one with an aluminum frame. See editors choice below. How long do they take to blow up? The inflatable kayaks we have reviewed below will inflate in 4-8 minutes. Can they easily fit in a car deflated? Most of the kayaks reviewed can be deflated in 2-5 minutes depending on the number of valves. Most of the kayaks below come as complete packages with pump, carry cases and paddles included. Note you will need to buy a personal floatation device (PFD) for safety. What is a sit-on kayak? Sit-on-top kayaks do not have a cockpit to sit in. You can buy paddle boards that actually convert to kayaks -See the Hydroforce model below. 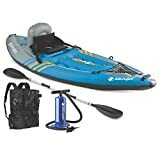 If you are looking for something more solid, this Advanced Elements inflatable kayak has a built-in aluminum structure that keeps the kayak rigid. The rigidity of this kayak means you can go much faster through the water as the aerodynamic shape is kept in place. This kayak can compete with most hardshell kayaks for performance. This kayak comes with a carry bag, folding seat, repair kit. A #1 choice if you are looking for a rigid kayak but don’t have the storage space. Advanced elements also do this kayak in 2 person, which is also a good option if looking for an inflatable kayak for fishing. Intex specializes in all things inflatable from kayaks, spas, and airbeds, but their inflatable kayaks are their best selling products. 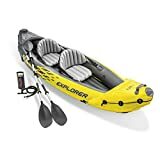 The Intex Explorer K2 is the best selling inflatable kayak on Amazon with over 1400 positive reviews. This is a great fun kayak as its made for two people which makes it a family favorite. 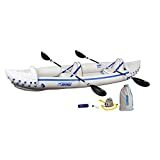 This is a complete inflatable kayak set as it also comes with aluminum oars and a decent hand pump. The Sevylor Quikpak has the advantage of a proper seat with a backrest, this can make a big difference if you get backache while kayaking. This kayak also comes with a carry bag and pump and can be blown up in 5 minutes. The Sevyor Quickpak also has a handy storage area at the front with secure roping plus a handy cup holder between the seats for your beer! This inflatable kayak can hold a total weight of 400lb and is 8ft long. The packed up dimensions are 103 x 36 30 inches, which means it can easily fit in the back of a small hatchback car. 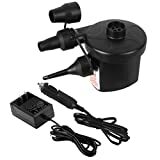 Quick Fill Air Pump comes with 3 nozzles, which can fit different valves. AC 100-240V/DC 12V, with car plug, more convenient to charge. Portable design, easy to carry and storage, perfect for camping, vacation or outdoor activities. Another top selling 2 person inflatable kayak. The Sea Eagle has super comfy seats for those looking at spending the day on a kayaking adventure. This kayak inflates in eight minutes and can take a maximum weight of 650 lbs – that’s 46 stone! Note that this is a full kit with pump, carry bag and oars. Airhead makes a range of watersports gear and has produced a very good 2 person inflatable kayak. The AHTK is one of the longest kayaks we have reviewed with a total length of 12 ft. This kayak is designed for lake kayaking and white water rafting – within moderation. Total weight of this kayak once inflated is 36lbs. This is an paddle board that converts to a kayak by adding a seat. It comes as a complete package so you get the best of both worlds. This is a very durable product as made of 2-ply reinforced polyester and double layered laminated PVC. This kayak weighs approximately 20lbs. Note: If you suffer from backache, kayaking on a sit-on-top kayak like this can hurt your back. 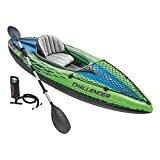 If you want to mainly do kayaking, then choose a sit inside cockpit inflatable kayak like those reviewed above.